Dune HD participated at CES in order to announce several new devices we analize below: Connect, Dune HD TV-102, TV-303d and Base 3D multimedia. The main functionality of Dune HD Connect is share wirelessly photos, videos and music stored on your mobile device while connected to an HDTV (high definition TV). It has the ability to stream content from iPhone, iPad, Android and tablets to any HDTV wirelessly. 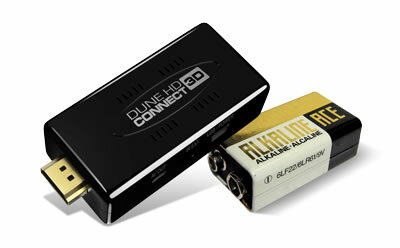 Simply connect the Dune HD Connect to TV’s HDMI port and launch the application Dune HD Connect on the mobile device to enjoy content on the big screen. It’s so small and portable that users can disconnect it and carry in the pocket to connect to any HDTV. Of course it requires Wi-Fi or LAN. It supports HD and 3D TVs with HDMI 1.4 with two different models available. They will soon develop more features to include ATSC, ISDB-T DVB-T/T2/C and digital TV tuner. Furthermore, Dune HD TV-102, TV-303d and 3D Base are now available for purchase. Provides support for compatibility with 3D video and decodes most popular formats such as SBS. It plays content from any source to your HDD player. The interesting thing is that when connected to the network can reproduce the image and content directly to a PC via UPnP, SMB or NFS. Integrates Player for playing MKV HD and SD, which includes almost all existing video files, such as HD movies with high bit rates (> 50Mbp / s.). It has USB ports for connecting the hard drives, memory sticks or USB card readers. Besides the HDMI 1.4 ensures compatibility for televisions, including 3D screens and projectors generation. Includes a full range of A / V connectors: analog audio outputs in stereo, the already mentioned HDMI and composite video output. The Dune HD TV-102 plays music in very high quality (up to 192 Khz / 24-bit). Files can be in multiple formats: FLAC, APE Audio APE, WAV / PCM, etc. You can create playlists or play files in folders in different shuffle functions. It has a very complete file browser and easy to use for the management of all material so we can keep and copy, move, delete, rename, organize, sort. On the technical side note that has SMP8674/75 Sigma Designs processor, has 512MB of RAM and 256MB of Flash memory. This device is similar to the above but offers a slightly more advanced functionality as the HDD rack with hot swappable. This way you can connect and disconnect SATA internal hard drives 2.5 “to exchange with Dune HD on. This can be exchanged at any time and increase storage capacity. It has more connectors and optical audio output S / PDIF. In terms of specifications has SMP8672/8673 Sigma Designs processor, has 512MB of RAM and 256MB +4 GB Flash memory. The device has the same features of the TV-303d but also has high quality audio (Dolby True HD, DTS HD Master Audio, LPCM, FLAC) and extended support for Dolby True HD and DTS HD Master Audi. The output bitstream (up to 7.1 channels) or decode to LPCM (up to 7.1 channels) for maximum flexibility when connecting audio and extended support of advanced playback features (such as Picture-in-Picture).